Perhaps you have always wanted to play the harp? Maybe you have thought about dabbling with a harp but harps just seemed too expensive? Harpsicle™ Harps are the answer for you. Harpsicle™ Harps are well designed, sturdily built and have the correct string spacing which make them an excellent selection for a first time harper. Light and portable, they are also a wonderful choice for harp therapy practitioners and are recommended by many harp therapy programs. 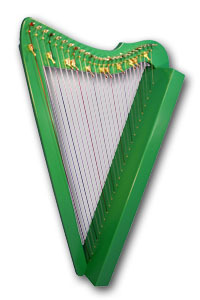 These simple harps have nice volume and tone. 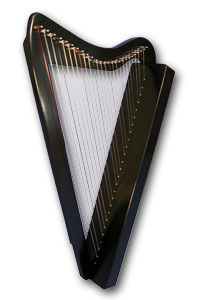 Harpsicle™ Harps are well made and maintain tuning as well as any professional harp. When you purchase a harpsicle harp, you may order it in the colour of your choice. The basic Harpsicle comes tuned to the key of C or A minor. There are no levers on this harp. 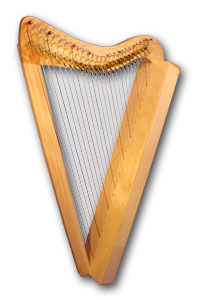 Sharpsicle™ Harps are identical to Harpsicle™ Harps with the addition of bridge pins on all strings and modified Robinson sharping levers on the C and F strings. This allows the harp to play in 6 different keys (C,G,D major and A,E,B minor) without retuning. Flatsicle™ Harps are identical to Sharpsicle™ Harps including the addition of bridge pins on all strings but with modified Robinson sharping levers on the C, F and B strings. This allows the harp to play in 8 different keys (C,G,D,F major and A,E,B,D minor) without retuning. Fullsicle™ harps are the top of the Harpsicle™ Harps line. There are bridge pins and modified Robinson sharping levers on all strings, allowing access to all keys. Price: $1350.00 CDN includes case, sticks and black guitar strap. Not to be confused with Pakistani and Chinese imported “harps,” Harpsicle™ Harps have the correct string spacing and maintain tune as soundly as any professional harp. Light and portable, Harpsicle™ Harps fit in the overhead storage bin or garment closet of most airliners. 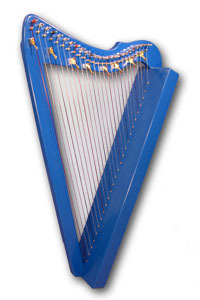 Even standing to play or marching in a parade is possible with a Harpsicle™ Harp. Harpsicle™ Harps are so portable, they make chairs optional! Extra levers can be added at the time of ordering or at a later date. Strings are available as a set or individually.